A high school senior is up for one of the most prestigious science awards in the country, and her story is all the more inspiring because it turns out her family is homeless. When it comes to high school science competitions, they don't get much bigger than the Intel Science Talent Search. Roughly 1,600 high schoolers enter it every year, hoping to win a piece of the $1.25 million available in prizes and scholarships. Each year, there are some truly impressive entries by some incredibly smart students, but one of the semifinalists for the current competition is especially impressive: Not only is she still in the running, but she's also homeless. Long Island native Samantha Garvey is a senior at Brentwood High School. Her research allowed her to learn that mussels change their shell thickness if predators (like crabs) are introduced to the environment. 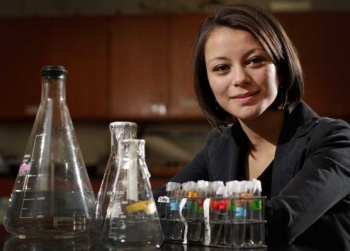 According to NewsDay, Garvey's spent over two years conducting research and is one of the 61 Long Islanders still being considered for the competition's grand prize, a $100,000 college scholarship. However, Garvey and her family are homeless, and they live in a local homeless shelter. According to the girl, her family's hardships are a motivation for her to do well in school: "I want to show other people that even if you're going through something bad, if you do, there's a better side to everything ... I want better, so that's why I do well in school." The fact that Garvey's circumstances haven't kept her from achieving such incredible academic success is pretty inspiring. If she manages to make it to the competition's finals, she'll receive a $7,500 scholarship and a paid trip to Washington DC and get an opportunity to speak with either President Obama or Vice President Biden. Hopefully she manages to make it to at least that point, but I'm sincerely hoping that she her project is awarded a higher placing and helps her forge a new, better life for herself.